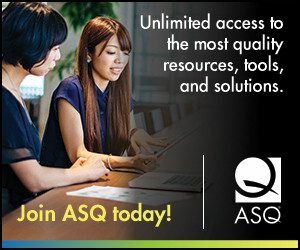 In my role as CEO of ASQ, I have many opportunities to explain quality. And here and there I have a chance to “sell” quality to a decision-maker. What happen as a result of these explanations and sales pitches is uncertain to me, but I welcome any opportunity to raise the voice of quality and spread the word. Nearly every workshop will include some variation of this question. How do I convince senior executives (often CEOs) and public officials that quality is important and an essential strategy for–pick your ending–performance excellence, competitiveness, growth, sustainability, survival, efficiency, effectiveness? I know this question has plagued the quality community for close to 70 years. I can hear the good Dr. Deming answer, “You don’t have to change (use quality). Survival isn’t mandatory.” Dr. Deming had a good way of challenging thought. Those of you who “sell” quality, and have the opportunity to pitch to senior decision makers: What have you found to be the essential answer? And for those who have the experience of taking the message globally, does the same pitch work everywhere, or do you have to adjust the story to accommodate cultural differences?